In the vast majority of the residential burglaries that occur in the United States the burglar does not cut the telephone line. There are several reasons for this. First of all remember, burglars are not rocket scientists. If they were intelligent they would be gainfully employed. Most burglars are juveniles or young drug addicts who are stealing to support their drug habit. They are simply not smart enough to cut the phone line, nor do they know where the phone line is located. Recently, one career burglar was interviewed while in jail. He was asked if he ever thought about cutting the phone line before he burglarized a house. He said that he thought about it but didn’t know which wire the phone line was and he was afraid that he would be electrocuted if he cut the wrong line! Burglars who rob commercial businesses however are typically a bit more sophisticated. Also, these burglars know that they can go behind they building or in an alley and work without being seen. It is for these reasons businesses are at a much higher risk than private residences are for their phone lines being cut prior to their break in. Consequently many commercial businesses such as banks and jewelry stores are required by their insurance companies to have digital cell back up monitoring added as a back-up to their primary land line security monitoring. One alternative to cell back-up monitoring if you are a home owner is to install a steel conduit telephone line protection kit to protect the telephone line as it leaves your telephone junction box. This kit is relatively difficult to find but it is available at some security distributors. However, if you are serious about providing a fail safe, totally reliable monitoring service for your family, we recommend subscribing to ADT’s world renown Security Link digital cell back-up monitoring. This gives you the ultimate in security monitoring protection and is without question the highest quality in the industry. Yes, we highly recommend ADT Monitored Smoke Detectors. According to the National Burglar and Fire Association a recent study was conducted and the results were that 50% of the battery operated, non-monitored smoke detectors in homes throughout America are inoperable. Also, remember, the inexpensive hardware store variety, battery powered smoke detectors are only designed to wake you up and get you out of your home alive if a fire erupts when you are actually in your home. Government statistics show that 64% of all house fires occur during the daytime when we are at work or at school. Most fires that start during the daytime without a monitored smoke detector result in the home becoming a total loss before the fire personnel are able to arrive. Pets that are kept in the house are lost as well. On the other hand, with a professional grade smoke/heat detection system that is monitored by ADT, as soon as smoke is detected a loud 95 decibel siren is activated to alert family members of the fire and simultaneously a signal is sent instantly to ADT’s Monitoring Command Center. ADT trained personnel then forward that critical information to the Fire Department closest to your home. This rapid response allows the fireman to arrive at your home in just a few short minutes. This gives them plenty of time to ensure that your family members, your pets, and your home is saved from total fire destruction. Most prudent homeowners realize the critical importance of protecting their home, family, and pets with an ADT monitored smoke detection system. Many of our customers tell us that fire protection was the main reason that they invested in their new security alarm system. Yes, absolutely, most insurance companies will offer you from 10% to a 20% discount on your homeowner’s insurance premium for installing an ADT monitored security system. Additionally, if you have a monitored smoke detection system installed with your ADT security system, most homeowner’s insurance companies will offer an even higher discount. 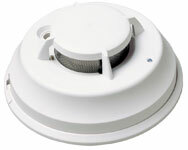 In many cases these discounts will more than pay for the cost of adding the smoke detection system. First of all, VoIP stands for Voice Over Internet Protocol. This service although generally less expensive than traditional telephone company landline service is lower in voice quality and much less reliable than a conventional land line. You need to be aware that if you are considering replacing your landline with VOIP service to save a few dollars per month, your existing alarm’s system will no longer be able to communicate with your monitoring station unless you have had a cellular or radio back up module installed in your security alarm master control panel. You also must subscribe to a digital cellular monitoring service from your provider as well. Unfortunately, many of the VOIP service providers do not disclose this major drawback to their customers in their advertising, marketing, and sales literature. Their customers find out after they make the switch to VOIP that they are totally unprotected because their alarm systems will no longer transmit signals to their monitoring station. Some of the more reputable VoIP providers do warn their customers now to keep a conventional land line if they own a security alarm system. There is also module now available that can be purchased from most competent security dealers that can be installed in your security panel that will allow your panel to communicate with the monitoring station using VoIP service. However, this module is expensive and you are still vulnerable to internet connection outages, viruses, and power failure which would render your computer and VoIP service useless. 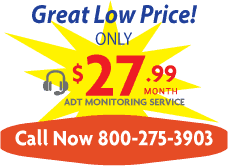 We recommend that if you must have VoIP Service that you subscribe to ADT’s Security Link digital cell backup monitoring service for only a few dollars more per month. With this added service you have the ultimate in security protection. In any event, whether you have a loss of phone service, someone cuts your phone line, or you suffer a power outage, the signal is transmitted over the air waves wirelessly (just like your cell phone) should you have an alarm event. If you move after you have been a customer with ADT two years or longer ADT will provide you with the ADT Mover’s Relocation Guarantee. This will allow you to have a free ADT security system installed in your new home anywhere in the United States. Additionally, you are eligible for a 25% discount on extra equipment upgrades. Please ask for the certificate for all of the details and any applicable restrictions. Unless your home is already pre-wired for window contacts we don’t recommend that you incur the added expense of purchasing window contacts. Adding window contacts to your system is very labor intensive and costly. Additionally window contacts are prone to service problems down the line. Over time as your house settles and your windows absorb moisture, window contacts can become misaligned and can be rendered inoperable. This can cause false alarms with your system. Also, window contacts can be defeated if a burglar enters your home by simply breaking your window glass and then enters through the damaged window. We recommend preventing burglars from entering through windows by installing our patented glassbreak detectors that are designed to trigger an alarm response by discriminating the sound of broken window glass. Glassbreak detectors are also far less expensive to install than window contacts. Many of our customers also decide to add another layer of redundant protection by installing our infrared motion detectors in each room as a back up. We offer our customers significant savings when they select bundled packages for higher levels of protection.